AOMEI Backupper is not only a free backup software, but also a free system and disk clone software for Windows 8 and Windows 8.1. Why We Need Clone Software for Windows 8/8.1? The Windows 8/8.1 users are more and more with time goes by. But no matter what operating system you are using, you will face a lot of hard drive problems. For example, with the usage of the hard drive, it will become old, and the storage space will run out. What should you do if this happens? What if the hard drive broken because of some reasons? It is no doubt that you need to change a new hard drive for the computer so that it can perform in a good state. However, if you change the new drive directly, you have to install a Windows 8/8.1 system again, and we know it will take a lot of time, what’s worse , the old data will be gone. The good news is that you can clone Windows8/8.1 and move it to the new hard drive, so that you can use the old system and keep the old data on the new hard drive. But with this, you need to find a third party clone software. Considering with the functions and price, here we recommend you the very best free clone software for Windows 8/8.1 - AOMEI Backupper Standard. Actually, it also supports Windows 10/7/Vista/XP. AOMEI Backupper Standard is a free powerful software designed by the famous company, AOMEI TECH. It is a free hard drive cloning software, but it has more than clone function. You can also use it to backup for your Windows, and restore the backup image. Besides, it has many other useful utilities, such as create bootable media, PXE boot tool, etc. With the friendly interface, even a non-technician can operate it alone. Back to the topic, cloning Windows 8/8.1 with this free software is very simple and easy. Even a few steps, you can finish the task. How to Clone Windows 8/8.1 with AOMEI Backupper Standard? As it mentioned, clone Windows 8/8.1 with this free clone software only needs a few steps. Here will introduce you the specific steps. First, download AOMEI Backupper Standard, install and launch it. You can see the deep blue interface of this software. 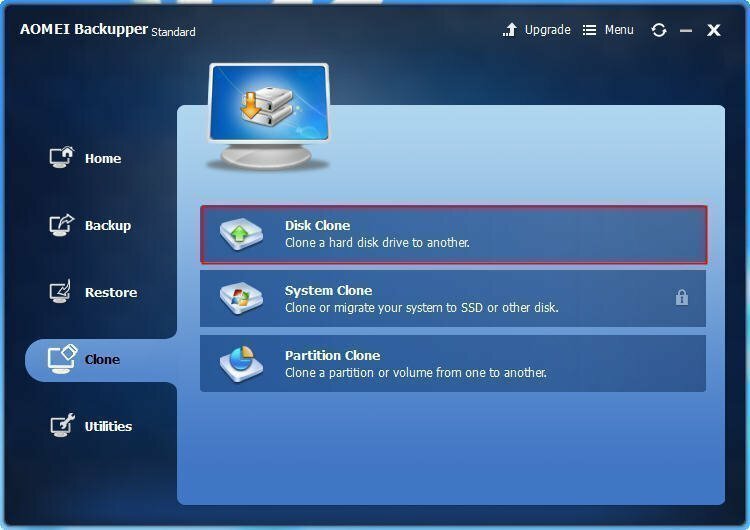 Click the "Clone" and select "Disk Clone". Second, you are moving to the Source Disk interface, and you can select the disk you want to clone by clicking it. Then, click Next to move on. Third, here you can select the destination disk on which you want to clone the source disk. Select the disk and click Next. Then, you will move to the interface of Operation Summary. Here you can edit partitions on the destination disk. You may have noticed that there are two options. One is "Sector by sector clone" which means that every byte will be cloned no matter it used or not. It will spend more time and occupy more space. Another one is "Align partition to optimize for SSD". If your destination disk is a solid state drive, you can select it so that it will optimize the performance of its partition. After all the settings, click "tart Clone" to start the task. When the proceed reached 100%, click "Finish". AOMEI Backupper Standard, the free clone software for Windows 8/8.1, is so simple. You can use it without worrying about the security. What’s more, the easy-to-use interface is very acclaimed by users.